When you have been a geologist for a long time you develop a real sense for the landscape; you gain insight and you just plain notice things that others don’t. With age and experience, you become an increasingly effective observer in the field. In many sciences it is the very young who do the best work. In my science, however, the most seasoned eye often sees the most and the best. There is one thing, however, that even the most experienced eye finds difficult, and that is seeing what is not there. That happens when Nature has painted a landscape but left something out. If you can notice the absence, you may be awakened to some wonderful moment in the geological past. But, just how do you see what is not there? Well, as I said, it comes with age and experience. And for you that starts right now; give me just a few minutes. 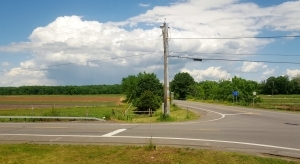 Let’s go to the intersection of State Routes 32 and 23A, just east of Palenville. Look to the northeast and see what you don’t see. There is a fine agricultural field, but what else can you see? The answer is not much. There are no canyons, rivers, no hills nor dales. In fact, there is just about nothing there. I have been by there many a time and I have long noticed that I wasn’t noticing much in the way of real landscape, just a lot of flatness. Well, all along, I did have some interesting ideas. I finally looked it all up in the geological literature and confirmed what I had suspected all along. This broad flat landscape, so well suited for the farmer’s plow, is sometimes known as the “Kiskatom Flats.” As I expected, the flats mark the floor of an Ice Age lake. The story of this lake takes us back to about 13,000 years ago when warming climates were bringing the late Ice Age to a fitful end. At that moment the Kiskatom flats were something you might call a glacial battlefield. The ice had, earlier, retreated halfway to Albany. Then the climate cooled briefly and the ice re-advanced to the southern end of these flats. That readvance was temporary, and the ice was once again melting away, this time for good. As the ice left the area, a landscape depression was left behind. With all the meltwater that is produced by retreating ice, this depression filled up quickly and hence the origin of Glacial Lake Kiskatom. The lake waters rose to an elevation of about 360 feet, and my guess is that it was four miles long, north to south, and one mile wide, east to west. It must have been quite a sight. On its northern shore there was still a great glacier, rising perhaps a few hundred feet above the lake waters. All along the eastern shore there was likely an equally thick glacier. This was the end of the Ice Age and the temperatures were quite warm. All of the ice was actively melting and vast volumes of meltwater were pouring out of the valley glacier. Imagine thundering cascades of raging foaming white water plunging into the lake. These glaciers were not melting so much as they were disintegrating. From time to time, enormous masses of ice would have detached and crashed down into the lake, breaking into numerous small icebergs. Believe it or not, huge tidal waves would soon have rippled back and forth across the little lake; such things do occur in small lakes. But what about that flat landscape? These are common throughout the Hudson Valley and into the valleys of the Catskills. As a veteran geologist, I am always on the lookout for them. It has been my experience that these almost always mark the locations of other old glacial lakes. What happens is that the meltwater is dirty with sediment which quickly accumulates as flat stratified sheets on the floor of the lake. Much later, after all of the water has drained away, the flat lake bottom becomes a wetland which slowly dries out into a flat field. The northeast corner of Kiskatom Flats is still a wetland. There are similar flats along the eastern banks of the Hudson River, that’s Glacial Lake Albany. There is another large flat area in the Schoharie Creek Valley, that’s Glacial Lake Schoharie. And there are more; you can start watching for them. Having just spent five minutes reading this article, you are more experienced and have a better trained eye. It’s time for you to start noticing such things. Go to Kiskatom Flats and see the lake with its bergs, look at the glaciers to the north and east and watch the raging cascades of water. You are seeing what is not there!